After seventeen years in the NFL, Ron Jaworski captivates as a dynamic public speaker who brings together the sports world and the business world with his enthusiasm and passion. In 1977, after being traded to the Philadelphia Eagles, Ron's dedication and determination on the playing field allowed him to lead the Eagles to the playoffs in 1978 and 1979. Then, after rallying the Eagles to a 12-4 record in 1980, Ron led his team to their first ever Super Bowl berth. 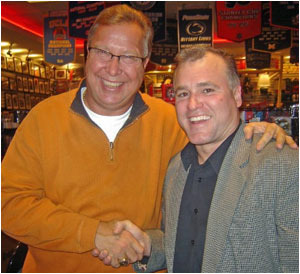 Over the years since Ron Jaworski has played football, Terry Bender Promotions and Mr. Jaworski have conducted numerous functions together such as Charity Events , Banquets , Autograph Signings, Meet and Greet functions and many more. Ron is top notch at speaking engagements where everybody that leaves the event becomes a Ron Jaworski fan. In 1991, Jaws founded Ron Jaworski Management, Inc. to oversee the day-to-day operations of his business ventures. Currently four different entities fall under the umbrella of RJM ownership: Valleybrook Golf Club, The Chateau Resort, Edgewood in the Pines and The Showcase Sports Apparel Store. RJM is also responsible for overseeing the business of the Maxwell Football Club of Philadelphia, the Ron Jaworski Annual Celebrity Golf Challenge and the Jaws Youth Fund Fall Golf Classic, which has raised over $1 million for support of innovative youth programs throughout Camden County and the country. In 2003, along with rock-and-roll icon Jon Bon Jovi, Jaworski became co-owner and President of the Philadelphia Soul, the 18th team to join the Arena Football League. He will continue to work directly with newly-hired Head Coach, Bret Musney on football operations as well as assist the organization on all strategic marketing opportunities. Aside from his business ventures, Jaworski is also a regular on ESPN, NFL Films and Eagles Television Network (Philadelphia) and has become one of the most distinguished NFL analysts on television. Jaworski gives fans a weekly, in-depth insider’s view of the NFL through "EA Sports NFL Matchup." Every Sunday and Monday, Ron assists on "NFL Sunday Countdown" and "NFL Monday Night Countdown" with his team-by-team analysis. Jaws has been the recipient of numerous honors including UPI’s 1980 "NFL Player of the Year," the Bert Bell Award, the Pinnacle Award and the United Way’s Volunteer Leadership Award. Jaworski was inducted into the Polish American Hall of Fame in 1991 and the Greater Buffalo Sports Hall of Fame in 1994. He was also nominated for the Pro Football Hall of Fame in his first year of eligibility and was inducted into the Philadelphia Eagles Honor Roll in 1992. Ron is a dynamic motivational speaker, bringing together the sports world and the business world with his enthusiasm and passion.It is recommended that you book 3-4 weeks before the event.